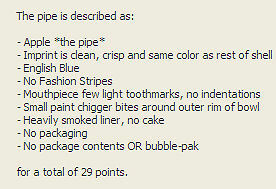 The value of pipe #378 is 29 points. The 2002 Chicagoland Pipe Collectors Club annual show was a smashing success as usual. I picked up three pipes there, two of which are additions to the collection. This very lightly smoked and flawless finish pipe was offered by Charles Myers and I happily bought it from him. It replaces the former example in the collection which has joined the Pipes for Trade page. When I got an un-smoked example of this shape/color, this one became available. Larry Arnold found it on the Pipes for Sale or Trade page and added it to his collection.